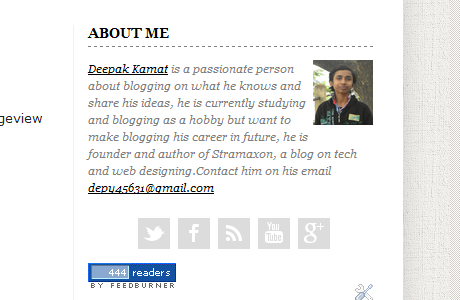 You can see how i have underlined my gadget's title to make it look different from rest of the widget content and it is a good way to keep your blog user interface easy. After so many days i am posting a blogger tutorial, in meantime i wrote some posts on blogging and SEO tips. As being a web designer i just can't keep myself from design tutorials so here i am again. Coming to the topic, in our blog you can see how we have underlined the gadget title on the sidebar to make it look apart from the content in the gadget, notice how a underline can differ the look of an area in your blog. As we found that underlining gadgets title can keep user engaged with the sidebar too, it's because when they know what's actually what, then they are supposed to use it often and same for the gadget. Underlining the gadget title will make it easy to understand and it will also look well designed. This can be done using CSS, the CSS don't just underline the title of gadget in sidebar but also formats it to look better, just like mine. So use this CSS if you want the overall customization of your gadget's title like mine. How to apply this CSS ? You have to make some changes to fit your needs, such as changing the underline (border) color and all. Line 4 : The font face of the gadget title, check this for the list of available web safe fonts. Line 6 : This border property makes the effect of underlining the title of gadget, you can change it's width by adjusting the 1px value. Change the dashed value to solid | groove | ridge | double | inset | outset | dotted and at end change it's color, use this color name reference to change the color of the underline. Line 7 : The defines the space between the underline and the title. You can adjust pixel value to your needs. Note : The line 1 is most important, because it's the selector. Depending on what your gadget title is marked up in you have to change it that way. But usually the CSS will work in most of the blogs. You should use chrome developer tools to understand what selectors you actually want. Some of my readers complained that the CSS I provided in the tut. doesn't work for all their gadgets it because some inbuilt gadgets have a little different HTML in for the gadget title and the default CSS I provided doesn't make any effect on it. Just added one more selector in the 1st line. Now it should work on all your gadgets but this might probably cause problems if you have h2 elements in your gadget content but in it works fine in most blogger templates. So, what is your thought about this tip/design ? Drop your comments with your views and opinions. And contact us for requesting any tutorial.